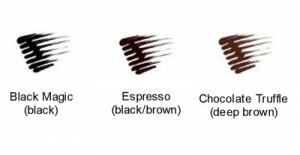 Product Ingredients: purified water, vegetable glycerin, beeswax, copernicia cerifera (carnauba) wax, vegetable glyceryl stearate, lecithin, vegetable stearic acid, safflower oil, glycine soja (soybean) oil (and) aloe barbadensis leaf extract, simmondsia chinensis (jojoba) seed oil, silica, cellulose gum, tocopherol, xanthan gum, chamomilla recutita (matricaria) flower extract, rosmarinus officinalis (rosemary) leaf extract, cucumis sativus (cucumber) fruit extract, phenoxyethanol. May contain: mica, iron oxide (CI 77499, 77491, 77492), titanium dioxide (CI 77891). Here’s proof that a truly natural mascara CAN be amazing! Our silky, lash-defining mascara is totally weightless yet provides all day color. The smooth light-as-a-feather base boasts zero clumping due to the absence of clay in the superior lash-conditioning formula. Bat your eyes and flutter your lashes without flaking and smudging. 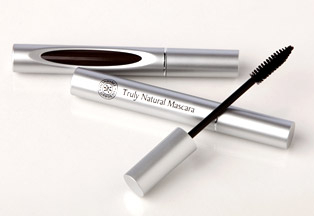 Perhaps best of all is that this botanically-enriched mascara is paraben free. Water-resistant, work-out proof. Not water-proof.